Johannesburg: A dominant USA thrashed India 4-1 in their second Pool B match at the Women's Hockey World League Semi Final at Johannesburg. There was plenty of action in the first quarter with USA keeping India's goalkeeper Savita busy at the post. They won a penalty corner in only the second minute of the match but Savita came up with an effortless save. A smart referral call by Rani, appealing that there was a back stick by the defender in her attempt to stop Rani from driving into the circle, saw India win their first PC. But an innovative variation didn't pay off as Deep Grace Ekka's strike lacked the power to carry it past the keeper. Almost immediately, India came close to scoring again when Vandana, brilliantly assisted by Rani, made a diving effort to deflect the ball into the post. Though she got a slight touch on the ball, it wasn't enough. With less than two minutes remaining in the first quarter, USA won their second PC but in vain as Savita came up with yet another great save. India came up with an improved attack in the second quarter. Rani managed to win India their second PC in the 22nd minute. She showcased exceptional dribbling skill to beat two USA defenders on the counter to find the foot of US defender in the D. But the chance to score went begging with stopper Monika miss-trapping the ball. USA however didn't fumble when given a chance. Jill Witmer dispossessed Deep Grace to drive into the circle and beat Savita to score USA's first goal in the 24th minute. Although India made a brilliant effort to equalise when Rani from the midfield sent a powerful pass to Vandana inside the circle in the dying minutes of the second quarter, but US keeper ensured they kept the lead with a great save. While both teams traded PCs at the start of the third quarter, it was a quick-thinking Monika, dribbling into the circle, who found Lilima Minz positioned perfectly to deflect. Minz made no mistake as she scored the equaliser in the 38th minute. 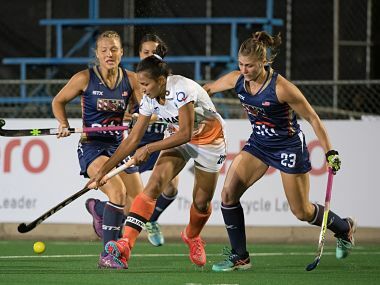 Though India played on par with the higher-ranked USA in the first two quarters, the equaliser saw USA change gears to put India under the burner. Only two minutes later, a miscalculated attempt to defend on India's part saw Taylor West (40') score USA's second goal. Jill Witmer scored her second goal of the match when she perfectly deflected a dragflick to extend USA's lead to 3-1 in the 43rd minute. The final quarter saw USA apply pressure, limiting India's chances in the striking circle with strong defence. USA continued to dominate with a fourth goal scored in the 49th minute. It was Michelle Vittese who scored the goal from the top of the circle. Though USA won another PC in the dying minutes of the match, nothing came off it.